Attended the University of Colorado and received a Bachelor of Science degree in Aeronautical Engineering. Carpenter entered the U.S. Navy in 1949 and received flight training at Pensacola, Florida, and Corpus Christi, Texas. During the Korean War, he served in Patrol Squadron SIX, flying anti-submarine, ship surveillance, and aerial mining missions in the Yellow Sea, South China Sea, and the Formosa Straits. He attended the Navy Test Pilot School at Patuxent River, Maryland, in 1954 and subsequently was assigned to the Electronics Test Division of the Naval Air Test Center. In that assignment he flew tests in a variety of naval aircraft including multi and single engine jet and propeller driven fighters, attack planes, patrol bombers, transports, and seaplanes. In 1957-1958, he attended the Navy General Line School and the Navy Air Intelligence School and was assigned as Air Intelligence Officer to the Aircraft Carrier U.S.S. HORNET. Carpenter was selected as one of the original seven U.S. Astronauts on April 9, 1959. He underwent intensive training with the National Aeronautics and Space Administration, specializing in the fields of communication and navigation. 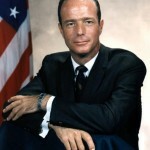 He served as backup pilot for John Glenn during the preparation for America’s first manned orbital flight. Carpenter flew the second American manned orbital flight on May 24, 1962. He piloted his Aurora 7 spacecraft through three revolutions of the earth, reaching a maximum altitude of 164 miles. The spacecraft landed in the Atlantic Ocean about 1,000 miles south-east of Cape Kennedy after 4 hours and 54 minutes of flight time. 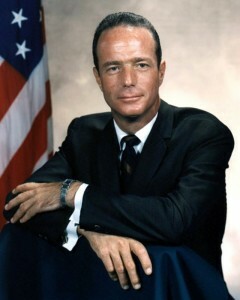 On a leave of absence from NASA, Carpenter participated in the Navy’s Man-in-the-Sea Program as an Aquanaut in the SEALAB II experiment off the coast of La Jolla, California. During the experiment, conducted during the summer of 1965, Carpenter spent 30 days living and working on the ocean floor. He was team leader for two of the three teams of Navy men and civilians who lived at a depth of 204 feet during the 45-day experiment. Carpenter’s awards include, among others, The Legion of Merit, The Distinguished Flying Cross, The NASA Distinguished Service Medal, Astronaut Wings, University of Colorado Recognition Medal, The Collier Trophy, The New York City Gold Medal of Honor, The Elisha Kent Kane Medal, The Boy Scouts of America Silver Buffalo, and The Numismatica Italiana Award. Since retirement from the Navy in 1969, Carpenter has made his home in Los Angeles, and continues to apply his knowledge of aerospace and ocean engineering technology to the private sector. He is married to the former Maria Roach, daughter of pioneer film producer, Hal Roach, and they have two sons, Matthew Scott and Nicholas Andre.